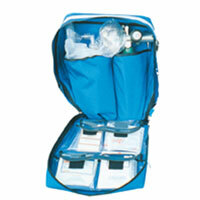 Designed to hold a "C" cylinder and a BVM on the back side with four clear vinyl pockets. Made of 1000 denier Cordura® nylon, the back side of the bags are nylon reinforced vinyl for easy cleaning and have self repairing #10 YKK nylon zipper with a storm flap. White 3M™ Scotchlite™ Reflective Material trim and a star of life. Color: Black or Royal Blue. Measures 15"H x 12"W x 7"D for 1,250 cu. in. of space. Wt. 80 oz.